And so the qualifiers are at an end and there was to be further movement to the tour survival standings today with victory for Stuart Carrington moving him up back up into the world’s top 64 at the end of the season. Crucially, this means that Stuart will retain his prize money won for next season and be able to continue his rise up the rankings, rather than go back to zero as he would have done had he lost his deciding frame to Li Hang today. Combined with Robin Hull’s victory against Igor Figueiredo, this means that dropping out of the top 64 is Nigel Bond, although the former Crucible finalist will remain on tour thanks to his position on the European Order of Merit. So can anything still change at the Crucible? The answer is yes, but simply put it would require either a semi-final run from Craig Steadman or Zhang Anda to push Joe Swail out of the top 64, otherwise we now know how the final standings in the race for main tour and top 64 players at the end of the season will finish. 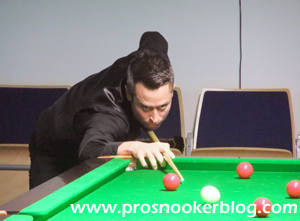 My first update from round two comes as the battle for top 64 places has seen an important and potentially decisive shift, with experienced duo Joe Swail and Robin Hull climbing up into that crucial bracket for the first time this season. For Swail the situation looked to be bleak as he trailed Welshman Dominic Dale 9-5, but as he has so often throughout his roller-coaster career, he came back to clinch a 10-9 win and climb up to 62nd place in the provisional end of season rankings, surely now enough to see him stay there and therefore retain his prize money won so far next season. Joining him is the perennially under-ranked Robin Hull, who just like last year has delivered at the World Championship qualifiers, defeating Ben Woollaston yesterday to reach the final qualifying round and sneak up into 64th place in the latest provisional standings. Dropping out at their expense are Stuart Carrington and incredibly Jamie Cope, who has paid the price for his agonising black ball defeat to Steve Davis last Friday. Of course both of these players would nonetheless remain on tour through the European Order of Merit and for Carrington he still harbours hopes of a top 64 place if he can defeat Li Hang tomorrow. Otherwise, it was a round where many of the chasing pack fell by the wayside, with Marcus Campbell, Chris Wakelin, Jimmy White and Noppon Saengkham all losing to higher ranked opposition. For Chris, Jimmy and Noppon, though disappointing, they will at least have the comfort of knowing that their main tour places are assured for next season, but for Marcus Campbell it looks to be the end of the road, two disappointing seasons now having caught up with him. In terms of the European Order of Merit, Hull’s run also means that at present Elliot Slessor, who has now been in and out of position all week, now looks set to miss out on a main tour place for next season, with James Cahill taking the last European spot. Elliot’s only realistic hope is that Robin loses out to Igor Figueiredo over the next couple of days, with Stuart Carrington winning against Li Hang to edge back ahead of the Finn at the last. If both Robin and Stuart are able to win however, then both would finish inside the top 64 and it would be Nigel Bond who would drop out, though still retaining his place via the European Order of Merit. 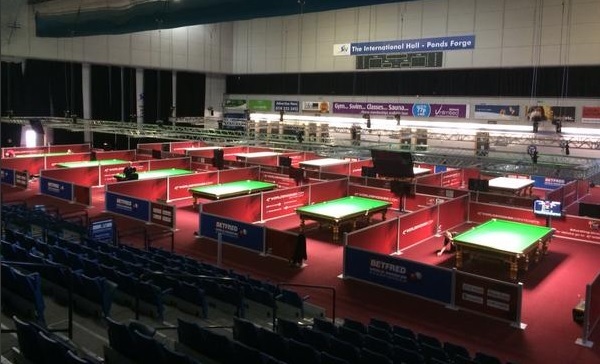 Today saw the conclusion of the first round at Ponds Forge and most crucially a resounding 10-2 victory for Tom Ford against Andrew Norman, a result that lifts the Leicester man up five places and back up inside the provisional top 64 after being knocked out yesterday. The result means that barring something incredible now, Tom will retain his top 64 place, while Alfie Burden, irrespective of whether he falls outside of the top 64, will remain on the professional circuit next season. It also means that with Joe Swail dropping back outside of the top 64, Elliot Slessor ‘loses’ the final European Order of Merit spot and must hope that other results go his way this week to put him back into position to qualify via that route. Elsewhere today, there were wins for Marcus Campbell, Robin Hull, Jimmy White and Noppon Saengkham, who all kept their hopes of a top 64 place alive and left us with the tantalising prospect heading into the second round of there being a string of players now just outside of the top 64 who are still in the tournament, while 61-64 have now already lost. 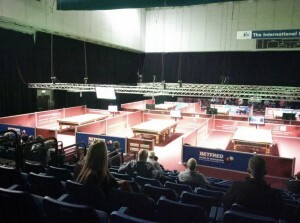 Day three at Ponds Forge was the day where the battle for tour spots and top 64 places really began to shift, with a change to the top 64 for the first time so far this week. First and foremost, Peter Lines has lifted himself out of the mix with victory against Latvian invite Rodion Judin, but the agonising black-ball defeat for Jamie Cope at the hands of Steve Davis this evening has left him unable to improve upon 62nd place this week. 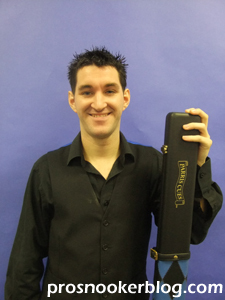 In terms of the chasers, Joe Swail climbed up above Tom Ford into the top 64 with victory against Swiss youngster Alexander Ursenbacher, a result which means that as things stand, Swail would retain his ranking and survive as a top 64 player, Ford would qualify through his position on the Asian Order of Merit at the expense of Cao Xinlong and Elliot Slessor would come into play for the final spot on the European Order of Merit (Swail no longer needing it). Of course, Tom Ford is yet to play his opening round match and so the situation can still change again, while victory for Chris Wakelin today also kept him in contention in 67th place. Marcus Campbell too has an overnight lead, while Robin Hull and Stuart Carrington also remain in the tournament as we approach the halfway point of this week’s qualifiers. A final point to note, as a few of you eagle-eyed readers have spotted already is that if Tom Ford were to lose to Andrew Norman tomorrow and both he and Alfie Burden be knocked out of the top 64, this would actually see Alfie relegated, as Tom would effectively take his Asian Order of Merit spot away. A brief update at 2am to report that Nigel Bond’s defeat to Igor Figueiredo this evening has left him unable to improve upon 61st, while victory for Stuart Carrington against Joel Walker has moved him up to within one win of breaking into the top 64, which could impact upon the other players vying to stay on tour at the moment. One day down at Ponds Forge and although it was not one for ‘movers’ there were nevertheless a couple of notable defeats that could become a factor later in the week. The first was for Rory McLeod, who was hammered 10-2 by Tian Pengfei and drops one place in the above list due to a win for Cao Yupeng (more below). Most concerning for Rory is the fact that if he were to fall outside of the top 64, he is not sufficiently high enough on either the European or Asian lists to retain his tour place via those routes, but on the other hand does still enjoy a reasonable cushion, with six players still needing to overtake him to put him tour place in peril. Rory was helped by defeat for Alfie Burden later in the evening, who can now do no better than 63rd and looks vulnerable to the likes of Joe Swail and Robin Hull, who could pass him with two wins this week, while Tom Ford needs just the one. On the plus side, Alfie would be safe either way thanks to his position on the Asian Order of Merit (potentially at the expense of Cao Xinlong), but he would of course much prefer to retain his points and standing from a top 64 finish. 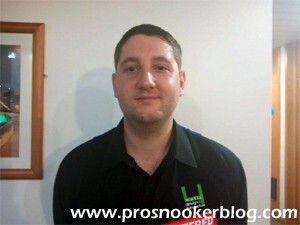 Another knock-on effect from Alfie’s defeat is that if he were to fall outside of the top 64 and be replaced by a player ranked highly on the European Order of Merit, such as Joe Swail or Stuart Carrington, this could yet hand Elliot Slessor a chance to remain on tour next season, whilst also strengthening the position of James Cahill. Finally, as mentioned already, there was a useful win for Cao Yupeng which lifts him from 61st to 56th provisionally, surely enough for him now to be certain of his tour spot for at least one more season. In comparison to last year, when you may recall that the gap between those inside and outside of the top 64 was considerably closer, the position is more clear cut this time around. In terms of players who are not safe already via other means, the two to follow are Robin Hull and Marcus Campbell, who need to win a minimum of two matches each at the Betfred World Championship qualifiers if they are to stand any chance of breaking into the top 64 at the end of the season. 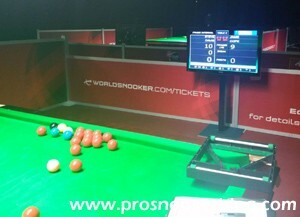 Campbell begins with an opening round match against invited player Ivaylo Pekov, with the likes of Mark King and potentially Anthony McGill lying in wait, while Hull may have to defeat Martin McCrudden, Ben Woollaston and Rod Lawler to make it to the Crucible for a second successive year. Also to be considered are Joe Swail and Stuart Carrington, who despite being safe for next season thanks to their results on the European Tour this season, will be targeting a top 64 spot in order to avoid their points total being reset to zero after this tournament. For Joe, he could do so with just a single victory in Sheffield, if Tom Ford were to lose his opening match, but more realistically looks to need at least two wins. Two players who cannot influence results themselves without doing something spectacular in Sheffield are James Cahill and Elliot Slessor, but both will be keeping a keen eye on the above battle as results could yet affect their own tour status. 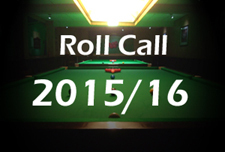 Cahill will be hoping that neither Campbell or Hull is able to break into the top 64 at the expense of somebody above James on the European list, such as Jamie Cope or Nigel Bond, while Slessor will be hoping that somebody above him on the European list such as Joe Swail or Stuart Carrington is able to break into the top 64 at the expense of Bond or Cope. Has Ratchayothin Yotharuck resigned his tour card? He has not entered WC qualifiers, but has entered the Asian U21 Championship (April 7-13) – is he planning on pulling a “Calabrese”?! I suspect so, will keep an eye out once the updated rankings are published this week. Ratchayothin Yotharuck was defeated by Yuan Sijun in Last 16. Yes it looks like it, can understand it as the entry fee is a lot of money if he doesn’t expect to win. But what actually happens when a player on the first year of his tour card breaks the top 64 (for instance Sam Baird)? Number 65 will be safe? Further thought. Isn’t Ford similarly situated to Alfie Burden? Has a ‘back up’ of Asian Tour ranking – but better ranked than Burden? So if both he and Burden fell out of the Top 64, Ford could push Burden off the Pro Tour? Just checked – it was Burden he beat to go a round further at the 3rd Asian Tour event. 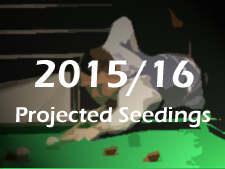 After all the talk last yr of the ex-world champions entering…none are in the draw! Was this rule changed, or did noone fancy it? Steve Davis has a wildcard anyway irrespective of his ex-WC status. A little aside question… I just looked at the rankings and tried to count the players who entered/left the T64 this season (no deeper reason, just for the sake of counting). As it stands before the end of round 3, I see six players who newly reached the T64 (David Morris, Gary Wilson, Kyren Wilson, Li Hang, Joe Swail and Robin Hull) but only five who dropped out (Jamie Cope, Alfie Burden, Marcus Campbell, Jimmy White, Dave Harold). This cannot be completely right, I seem to be forgetting someone… anyone to help? Ah yes, thank you. What a long season, by now I was totally used to him being away from the tour, completely forgot that he only resigned less than a season ago. Who was the guy McManus was on about in that press conference that nearly scraped on through the APTC list having not beaten a single pro all year?